One of the great things about the UK, unlike my native America, is that it continues to produce some really good traditional hard rock bands, and also give them the recognition they deserve. 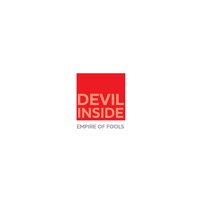 Empire Of Fools is another one making some waves, possibly being on the cusp of greatness with their second EP, Devil Inside. Empire Of Fools is that familiar blend of what's classic and contemporary. Their sound is mixes traditional melodic hard rock with heaviness of post-grunge, the crispness of alternative rock. But, fundamentally, what they do is rock, with groove and melody buffeting the large and sharp riffs and thumping rhythm section. Then they toss in some good clean melodic vocals and more than a few catchy turns in arrangement and refrains. 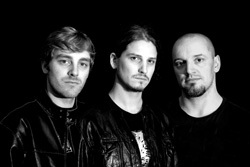 Their sound is large and encompassing, almost an arena rock flavor. And the do all this as a trio. As for the songs, the hard and heavy melodic rock and groove begins at the start with the catchy refrain of Down To Earth, the riff rousing Higher, and Devil Inside, having this suspicious bounce to it's groove. Both Dirty Mind and Hope spins things a bit softer, beginning with acoustic guitar and drums accompanying the vocals before rising after the midpoint. Both are exceptional examples of EoF's melodic vocal arrangements. Unstoppable picks up where the EP started, generally raucous with those heavy bristling riffs concluding with a lively, nearly shrill, guitar solo. Besides their fundamental hard rock roots, I think one of the persuasive things about Empire Of Fools is simply the immense presence of their sound, which probably sounds pretty terrific live. All in all, though short, with Devil Inside, Empire Of Fools is on the right path, hopefully for greater success. Recommended. Though short, with the hard and heavy melodic rock groove of Devil Inside, Empire Of Fools is on the right path, hopefully for greater success. Recommended.